← HAPPY THANKSGIVING TO ALL OUR CANADIAN FOLLOWERS! With a crisp, buttery crust and a soft crumb, these gluten free hamburger buns are sure to become one of your go-to recipes. 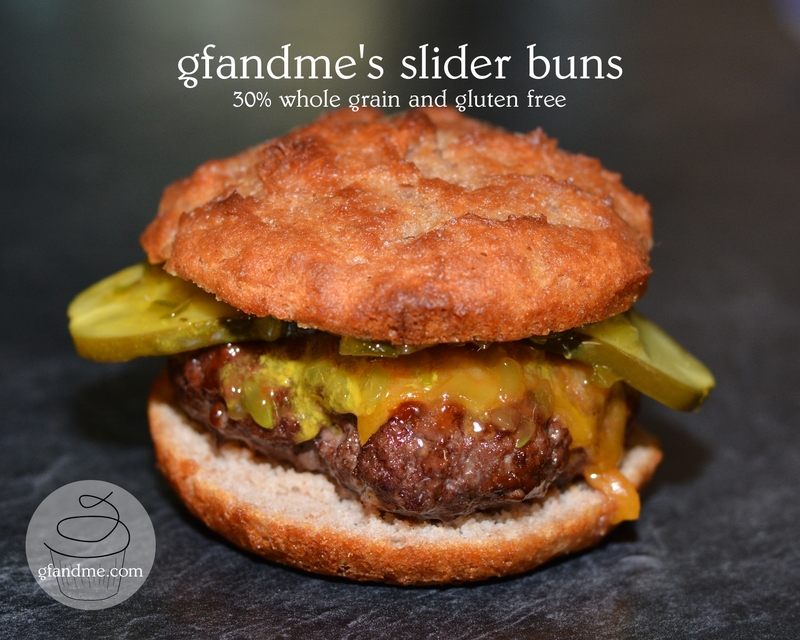 Pictured here are a slider bun version, but you can make these any size you want so go ahead and have that quarter-pound burger… No one need know they are 30% whole grain! A variation on our tried and true lean crusty bread and white bread recipes, these buns are easy to make and taste fabulous. Even people who don’t like crusts tend to love the buttery saltiness that covers these! For the first time in years, Geoff preferred the bun to the burger! TIP: If you are using another flour blend, you may need to add a little less or a little more water. If your blend does not have xanthan gum, add 1 teaspoon. TIP: We use “100% Whey Protein” which can be purchased at health food and body building stores. Be sure you buy one that is unflavoured. TIP: Expandex is hard to find here in Canada. You can order it online but delivery is pricey. You can also leave it out. The buns will taste the same but will have a slightly different texture. Lightly grease round tins in the size of bun you want. We use four 3-inch tinfoil pie pans (the kind you use to make individual pies). In a medium bowl or 2 cup measuring cup, stir together the warm water, sugar and yeast. Set aside for at least 5 minutes. In large bowl, combine dry ingredients with a whisk. Make a well in the centre and pour in the activated yeast. Stir until combined and comes together in a wet sticky mass. Divide the dough into the number of pans. Cover and set in a warm moist place to rise for 1 hour. TIP: We cover the buns with a slightly dampened tea towel or plastic wrap and set them in an oven that’s been warmed slightly (do not go over 100 degrees) and then turned off. Leave the door slightly ajar. TIP: They can also be left to rise overnight in the refrigerator. When you are ready to bake, heat oven to 400 degrees. Melt the 2 tablespoons of butter. Carefully brush the tops of the buns with about half of the butter. Sprinkle with salt and bake in the oven for 25 to 30 minutes or until a golden brown, crispy crust forms. Remove from the oven and brush the tops with the remaining butter. Set aside to cool. Enjoy with your favorite grilled burger, chicken breast, or veggies and cheese. This entry was posted in Baking, Lunch and Dinner, Recipes and tagged bread, buns, Cup 4 cup, gluten free, teff. Bookmark the permalink. Thanks. They really are good!